When it comes to gaining lean muscle it takes time, effort, and a lot of hard work. Most of us would like to build muscle overnight, but like a lot of things in life we want them now, unfortunately, things just don't happen that way. This does not mean that gaining muscle fast is impossible, there are things you can do to speed up the process. In this article, I will share with you a few tips along with 3 bulking supplements that can help you gain muscle fast. Before you consider taking a dietary supplement you want to make sure you are doing a few things right. Anyone who is serious about gaining muscle needs to make sure they have a proper game plan and carefully laid out routine. Focusing on arms and smaller muscle groups is not going to help you gain muscle. You need to target primary muscle groups! Working major muscle groups is the best way to gain muscle. This is done with compound movements, these are the best exercises for quick muscle gains. Don't focus too much on your arms, those will get a good workout from doing compound movements. Major muscle groups require a lot of energy but they are the ones that will set the foundation for you being able to gain dense muscle. In order to train hard, you need to make sure you follow a good diet. Most people try and tell you specifically what foods you should eat. I'm not going to do that because everyone has their favorite muscle building foods. Most of you already know that in order for muscles to grow they need protein, so it's important that you supply your muscles with plenty of it. If you just started working out you should probably just focus on training and diet for the first few months. Once you have your diet and workout routine nailed you can then start looking at supplements to help you make more muscle gains. A good sports supplement can help, especially for those who are hard gainers. Not only will it help you build muscle it will give you more strength and endurance. A lot of young men think about taking anabolic steroids, however, you need to look at bodybuilding in stages. Most pro bodybuilders trained for years before even considering anabolic steroids, plus, the right supplements can give you similar results without the side effects. Supplements were intended to supply your body with certain nutrients you may not be getting with a regular diet. Some of the supplements below contain prohormones which are even more effective than regular sports supplements. Below is my list of the 3 best supplements you can take to gain muscle. The Marine Muscle bulking stack is the most powerful bulking stack you will find anywhere, don't believe me? I invite you to do your homework. Yes, there are others who make these same claims but many of them are too afraid to even list their ingredients. Marine Muscle legal steroids include 4 individual products that contain some of the most powerful substances you will find in any muscle building supplement. The stack is formulated for men who are serious about working out and want a quick way to gain muscle. The only downside of to Marine Muscle legal steroids is that they are only available in the U.S, unfortunately, they are not sold in the U.K or Europe. Drillmaster is one of the essential ingredients in the bulking stack to help you increase strength and muscle fast, even hard gainers will benefit from the formula found in Drill Master. Enduro is important for helping you maintain endurance and strength. If you struggle trying to bust through strength plateaus, you will have a hard time packing on muscle. Enduro will put an end to that problem and help you gain strength, train harder, and speed up muscle recovery time. Gunner helps increase vascularity and strength, sure, you want to gain muscle but you also want to keep fat to a minimum which is why gunner is so important when bulking. Trooper contains several testosterone boosting ingredients to help increase luteinizing hormone and help you quickly gain muscle. The Marine Muscle bulking stack cost $219.99 this makes it the most expensive of all three but it is also the most effective. Click here to order or read my full review here. The bulking stack is one of the most popular stacks sold by Crazy bulk, it includes four products specially made for men who want to quickly pack on extra muscle. 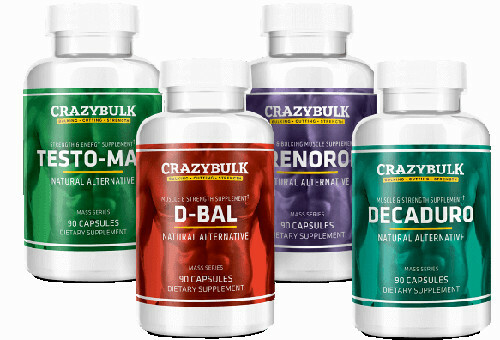 Crazy bulk is sold in most countries and has gained tremendous popularity over the last several years. At one point the brand was widely criticized because of its weak ingredients, however, the company has made changes and have increased the potency of their formulas. D-Bal has some important benefits that will help you gain muscle and increase strength, the stronger you are the more muscle you can gain. Decaduro’s main benefits include increased strength and endurance, fast muscle recovery times and eliminating joint pain. Trenorol is a strength agent to give you raw lifting power and is great for both bulking and cutting. Testosterone Max, the word says it all, testosterone is the main hormone responsible for strength an muscle. 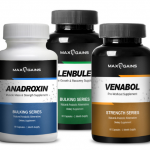 Testosterone Max is the one ingredient that will send testosterone levels through the roof. While not the strongest bulking formula, Crazy bulk ships worldwide and offers free shipping on all of their products. Max Gains Bulking stack is one of the lesser known legal steroids sold, which in my own opinion is unfortunate. Because anyone who knows about supplements will appreciate the ingredients you will find it this stack. 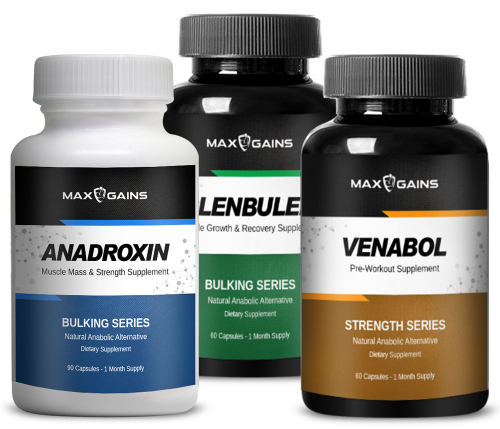 Unlike Marine Muscle and Crazy Bulk, the Max Gains Bulking stack consists of three 3 individual products versus four in the other stacks. Does this mean its less effective? Max Gains is produced in the U.S by Vitabalance Inc. a well-known supplement company that has been delivering quality for over a decade. Anadroxin is a powerful Anadrol alternative it mimics the effects of the popular steroid Oxymetholone Anadroxin contains powerful ingredients to help increase muscle density and mass. It helps boost blood flow in the muscles and boost nitrogen retention. Clenbulen is a safe alternative to the drug Clenbuterol, it's ephedrine free so there are no side effects. Taking Clenbulen will give you over the top energy and more endurance so you can train with like a beast with intensity. Venabol is a legal Dianabol alternative that will help increase nitrogen in the muscle and increase protein synthesis, this will ensure that your muscles take advantage of the protein your body gets and puts it to good use. Max Gains has always been one of my favorite supplements for gaining muscle. This triple formula combination will not let you down. Max Gains Bulking stack cost $126.95 making it the cheapest bulking stack, however, don't let the price tag fool you its powerful and delivers what it promises. Gaining muscle does not come easy, like everything in life the harder you work for something the better your results will be. I have personally used each one of the bulking stacks above and they have all been effective. Marine Muscle is my first choice because it is the most potent of the three, however, it is only sold in the U.S.
Crazy bulk and Max Gains run a close tie so its more about price than anything else and either one will give you great results.